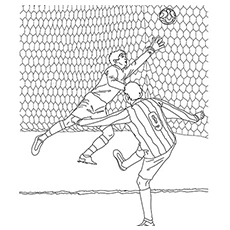 Soccer has for decades captured the imagination of sporting enthusiasts from around the world. 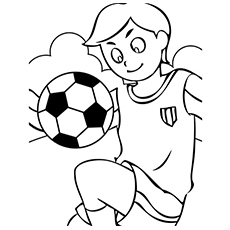 If you have a young kid who enjoys the sport, then these coloring pages should be perfect for him to relive his favourite memories of the sport at home as well. 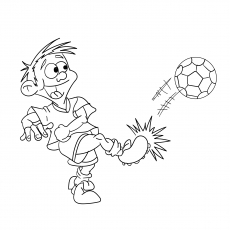 With the recent conclusion of the FIFA World Cup in Brazil in July, football fever is still in the air and so giving your boy a few soccer coloring pages will excite him beyond words. You can also invite his other friends over and host a collective coloring session to ensure that he has company, thereby, making things more exciting for him. 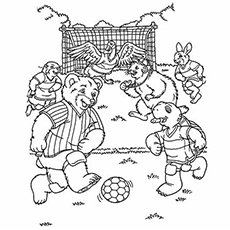 These soccer coloring sheets will excite your little kid beyond measure as it gives him the opportunity to combine two of his favorite passions – soccer and coloring. Also, it will leave you with extra time on your hands to complete other household chores that you have pending. 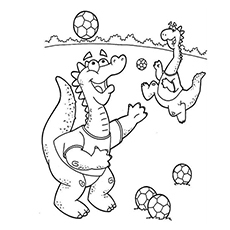 So give your kids these amazing soccer coloring pictures to color and print. 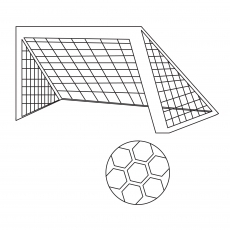 This is a great picture for your kid to start things off with because it showcases two of the main symbols associated with soccer – the net and the soccer ball. Your kid will learn to use all his playing experience to get the colors right when coloring the image, thereby improving his memory power. This picture is perfect if your kid is below the age of 6 years and is just learning to color but has a passion for the sport. This is a great picture as it is filled with action and will excite your kid because it is a true representation of a player in motion. This picture is perfect for kids who are above the age of 7 years as it is a little more complicated to color. 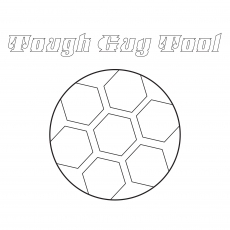 This picture is an upgrade and allows your child to choose funky colors when coloring the soccer boot. Your kid will also learn how to spell the word – ‘SOCCER’. This picture will make your kid jump for joy and may even inspire him to gather his friends and go play soccer after the coloring session. 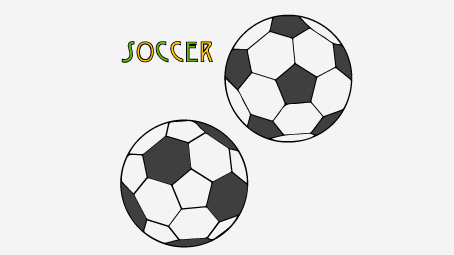 The soccer balls give him the opportunity to use various colors to color the different balls. This picture will also help him revise the spelling of ‘SOCCER’ which is mentioned in big, bold letters. 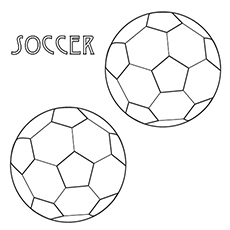 It will help him focus on coloring within the lines as each soccer ball has numerous dimensions to it. This picture will provide the impetus your boy needs to pick up a soccer ball and perform some innovative tricks of his own. Your child will learn how to color a human figure in motion. The number of objects in the picture makes it a slightly complex coloring task and is therefore more apt for children who are slightly older. This picture is apt for children who want comic relief and have a sense of humour! Will improve your kid’s hand-eye coordination. The boy suspended midway in the air is sure to excite your kid. 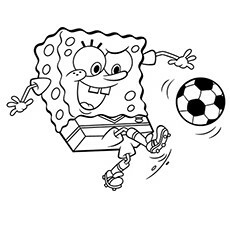 This picture is sure to be a hit because it include the hit cartoon character – Spongebob Squarepants. Your child will be glued to the coloring page because it has his favourite cartoon character in it as well. He can use it as a poster once done coloring, and hang it in his room. This graphic picture is exciting as it showcases a boy scoring a goal. Your kid will now focus his attention on coloring the picture perfectly because of the various elements involved. Your child will feel elated coloring this picture with his friends. This picture is fun and suited for smaller children. The picture will introduce your little boy to dinosaurs. The interesting shapes will appeal to your kid. 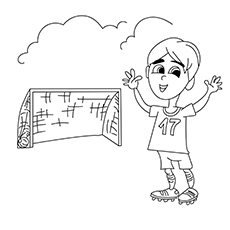 This picture is sure to interest your kid because it is associated with the happy feeling of scoring a goal. Your kid will learn to color images which are situated at a distance. Your boy may want to narrate stories of how he scored a goal at soccer practice in school. This picture is fun and entertaining, and sure to be hit with kids and adults alike. 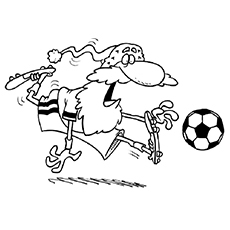 Your child will find immense joy in coloring Santa playing soccer. After coloring, your kid will find the poster ushering in the spirit of Christmas. This picture will introduce your kid to the world of animals. Your kid will love the fact that animals are also playing football. This picture is apt for bigger children. This picture will be fun to color as it incorporates ‘The Smurfs’ in it. 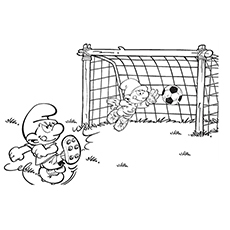 Your child will enjoy coloring a visually appealing picture of The Smurfs playing soccer. He may want to watch the cartoon or the movie involving The Smurfs, let him. Your kid will be able to relate to the ‘Nike’ symbol on the ball. 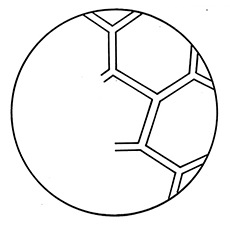 The ball has various dimensions which will help him to color a complex picture. This picture is for children who have already played soccer for some time now. 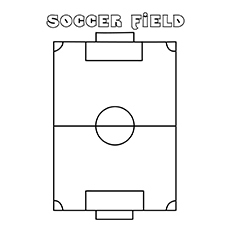 The large soccer field is every boy’s dream to color. The largeness of the image will make it easier for your child to focus. He will learn how to color large spaces without going out of the specified line. The half completed soccer ball will help him to replicate the drawing on the blank side. Coloring this will require some amount of skill. Tigger is the unforgettable character from ‘Winnie the Pooh’. He is always active and jumping around. In the picture we see him playing football. If your little angel is addicted to Winnie the Pooh books and television series, he or she will need little guidance to color Tigger and the football. The background is kept plain so that your child can add some color there and make the page look bright and cheerful. You can ask your child to use some special effects with colors to show Tigger’s high level of energy while kicking the ball. Children love animated characters, using them in coloring pages makes coloring an interesting activity. 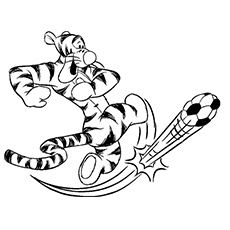 When your child sees Tigger playing football, he or she will also want to play football. This page will surely make your little one a football aficionado! Football boots called cleats or soccer shoes are an item of footwear worn during football. The soccer shoes designed for grass pitches have studs on the outsole to help the player have a firm grip. It is important to have good soccer shoes since the ball is played using the foot. The design of soccer shoes has undergone in depth research and development. You can’t call it football boots because it doesn’t cover the ankles. Different sports companies make different types of soccer shoes. 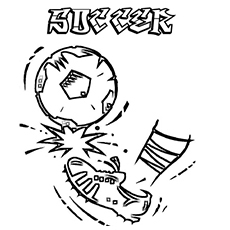 The shoe is designed according to the type of surface or the pitch, the wearer’s position and role in the game. For example, on hard pitches a player can wear sneakers or plastic stud boot and for well grassed or sodden field screw in studs are recommended for firmer grip. The naughty boy in this picture is showing tricks with the football while the game is in progress. We see an anxious looking goal keeper waiting for the ball to come into his hands. Other players are also focusing at the ball to see which direction the ball is about to go. This picture will keep your child guessing too! There is a surprise and fun element in this picture which will make coloring this page really enjoyable. Football is not just a boy’s game; girls are equally good at it! That’s why FIFA also organizes a Women’s Football World Cup, where star woman football players compete with each other for the most prized trophy. 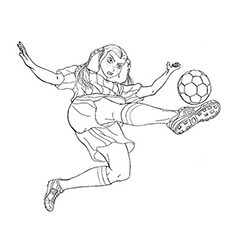 This picture shows a girl kicking the football. The ball is sure to make it to the goalpost. You can see that she is aggressive and focused while kicking the ball. Her passion for the sport is clearly understood from her face and body language. There are minute details in the picture which your child will enjoy coloring. Your little daughter will be truly inspired after coloring this page. You can pin up this picture in her room and encourage her to play a sport that will keep her fit and active. The Fédération Internationale de Football Association or International Federation of Association Football is the International governing body of association football, futsal and beach soccer. FIFA is responsible for the organization of football’s major international tournaments, notably the World cup and the Women’s World Cup. The 2014 FIFA World Cup was the 20th FIFA World Cup, which took place at several venues across Brazil. Germany won the coveted World Cup trophy after defeating Argentina in the final. The football fans across the globe had their eyes glued to the television sets during the World Cup. 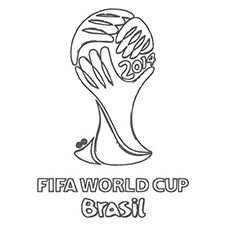 In this picture, we see the official logo of the 2014 FIFA World Cup. If your child is familiar with the game, then he or she will definitely enjoy coloring this page. Make sure he uses the right colors to make this logo look realistic. 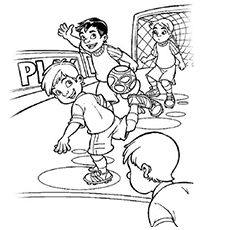 The free printable soccer coloring pages online are sure to be a hit with your child. Young boys and girls are fascinated by the energetic and fast paced game of football and usually put their heart and soul into playing it. You may have to pry your child away to focus on his studies! It is a great way to engage him in something productive by using his favorite sport as inspiration. 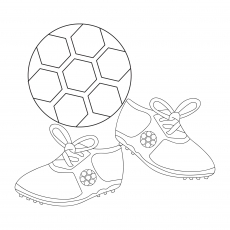 Share your thoughts about these free printable soccer coloring pages.